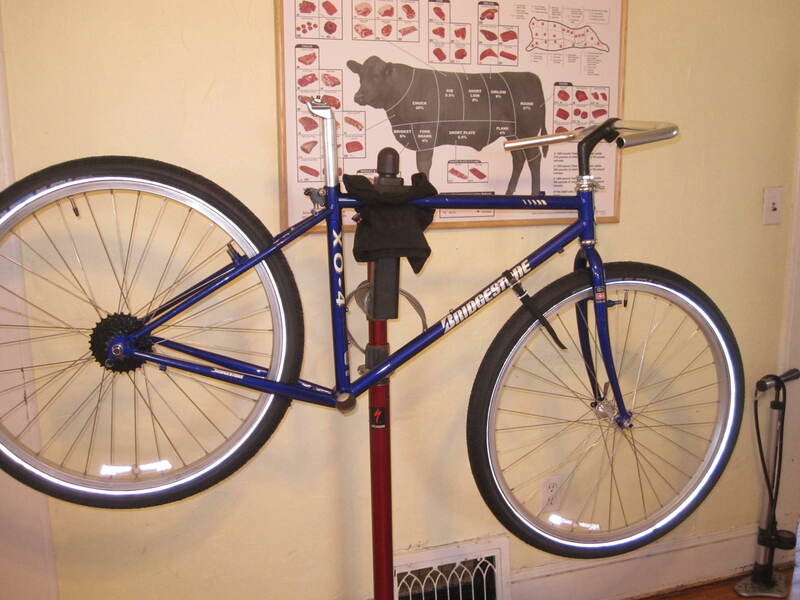 Building a bike from scratch isn’t actually that difficult if you have all the parts and know what you are doing. Having short weekends has not helped my burning desire to finish this bike. 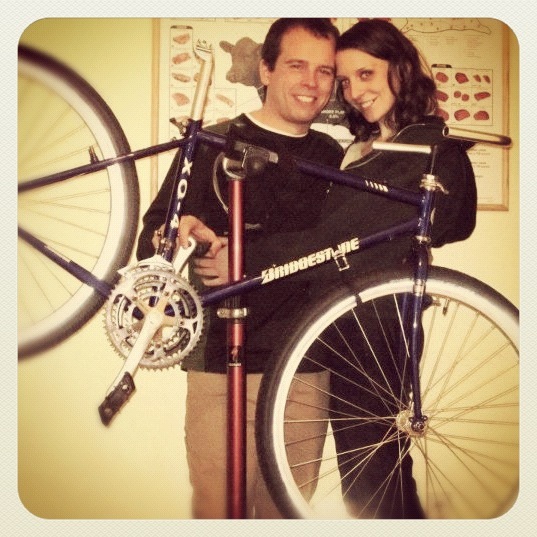 But, my bike will be built soon, I hope, for I have many outdoor adventures I want to have it for. No, it’s not that I don’t have any other bikes–I have four already, but this bike is special. 1.I started with greasing the threads in the big bracket shell. Then, I greased the cup and put it into the threads using my hands to turn the cup until I could no longer do it with my hands. That’s when I turned to a 35mm wrench. 2.I then greased the bearings, quite liberally, because those will be used a lot during riding.After, I slid the bearings on each end of the spindle-note: make sure the bearings face outward. Then,I greased up the threads on the ends of the spindle because eventually the ends will receive a nut. 3. Now I returned to the adjustable cup. After greasing the threads at the ends of the spindle, I slid the spindle through the adjustable cup. 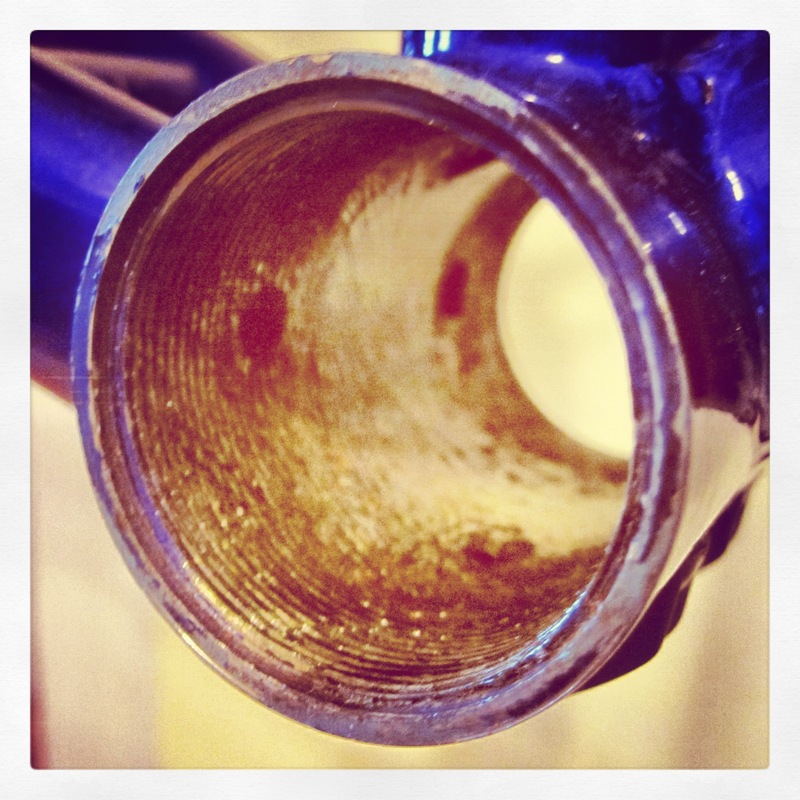 The Bottom Bracket shell is an important component because it houses the parts of the bike which rotate– the adjustable cups make sure the spindle stays in place, and the crankarms which are attached to the ends of the spindle, allow for the bike to move. 4. When you add the adjustable cup, you do not want the spindle loose. Hand tighten the cup down until it takes up as much “free play” as possible. 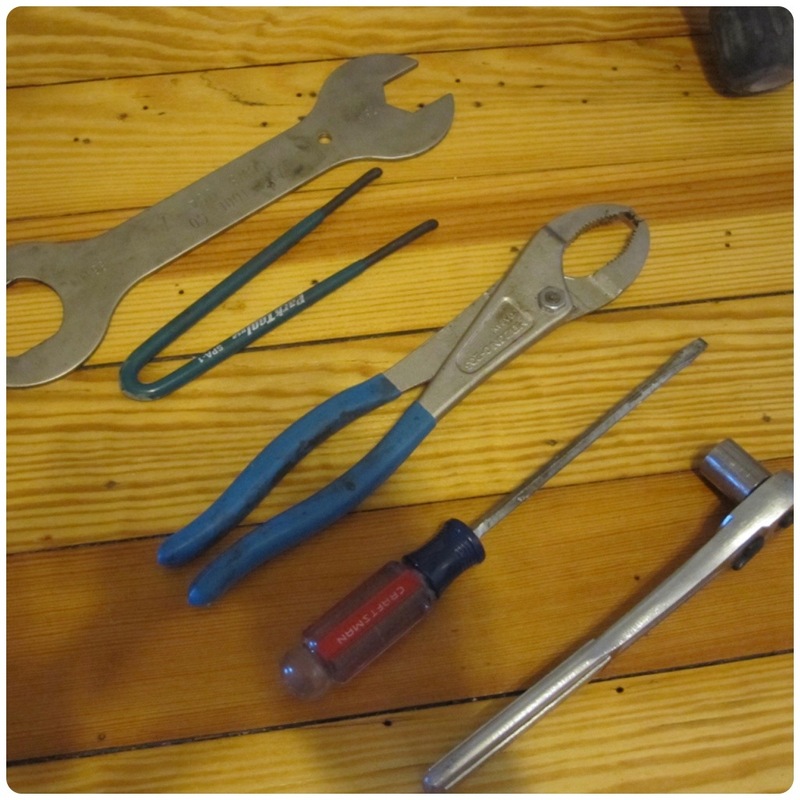 Then, you use the lock ring pliers and bottom bracket fixed cup wrench, at the same time, to tighten the lock right–the lock ring keeps the adjustable cup from moving. ** When you remove the tools, and there is a little bit of “leeway” with the spindle,it is okay. 5. Now it’s time for the rear derailleur. You need to grease the threads and this is when you will need your ALLEN KEY. There are two types of rear deraileurs–short cage and long cage. 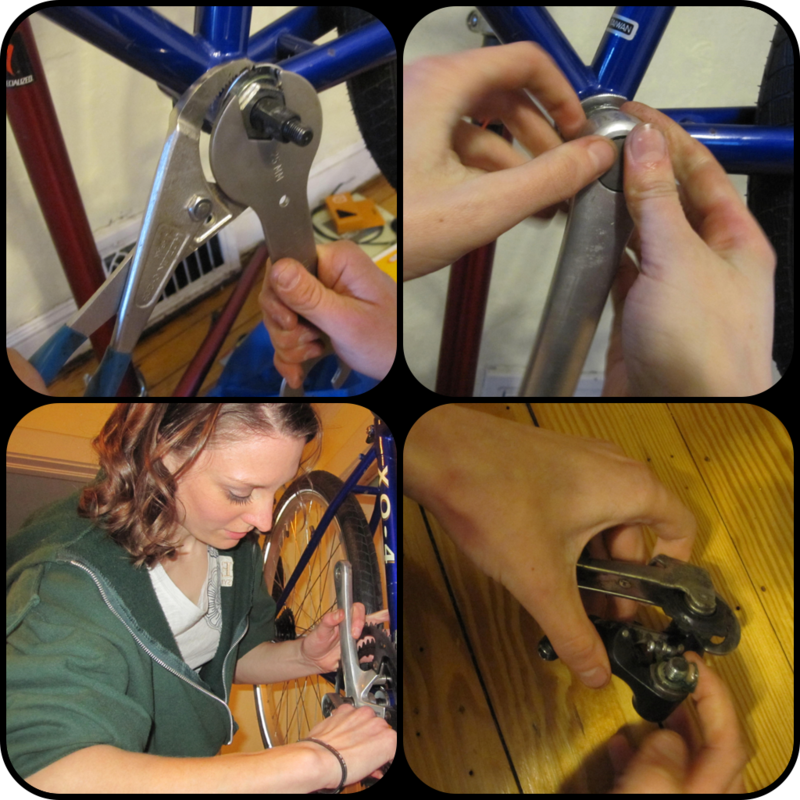 “Cage refers to the two side plates that hole the derailleur pulleys apart. A short cage derailleur is used primarily in conjuction with two-chainring drivetrains like those commong on road racing bikes.Long cage deraillerus allow for a greater difference in cogset and chainring combinations and are most or very wide-range cogset in the rear. 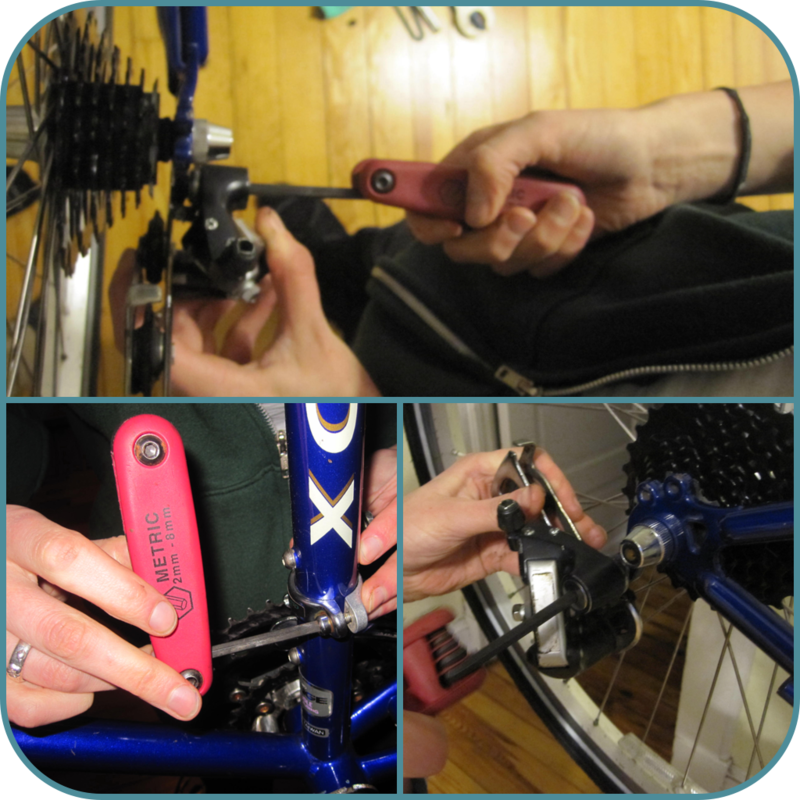 there are also mid-cage or medium care gear derailleurs that are sometimes favored by mountain bikers who opt for two from chainrings instead of the usual three” ( Downs, The Bicycling Guide to Complete Bicycle Maintenance &Repair, Rodale Inc, 2010, p. 227). 6. 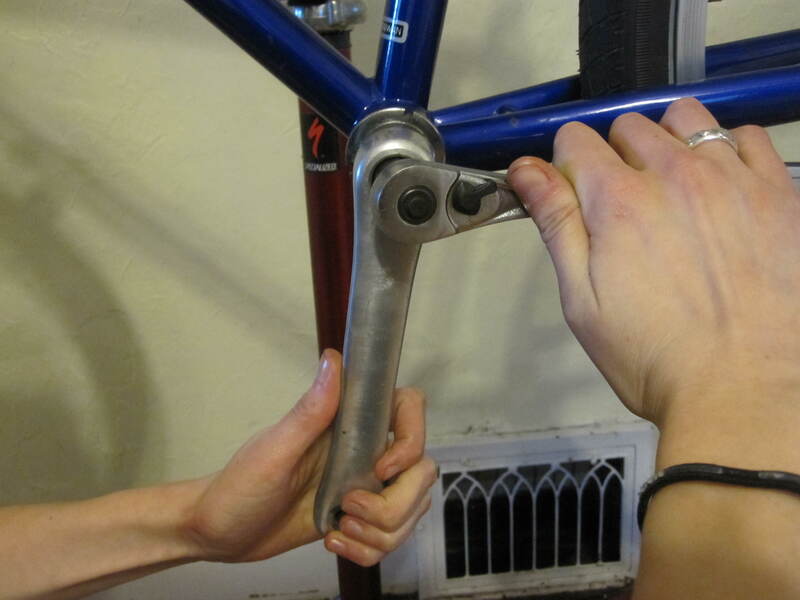 For the rear derailleur, you need to grease the threads and attach to the bike using an allen key.You want the derailleur to be snug. 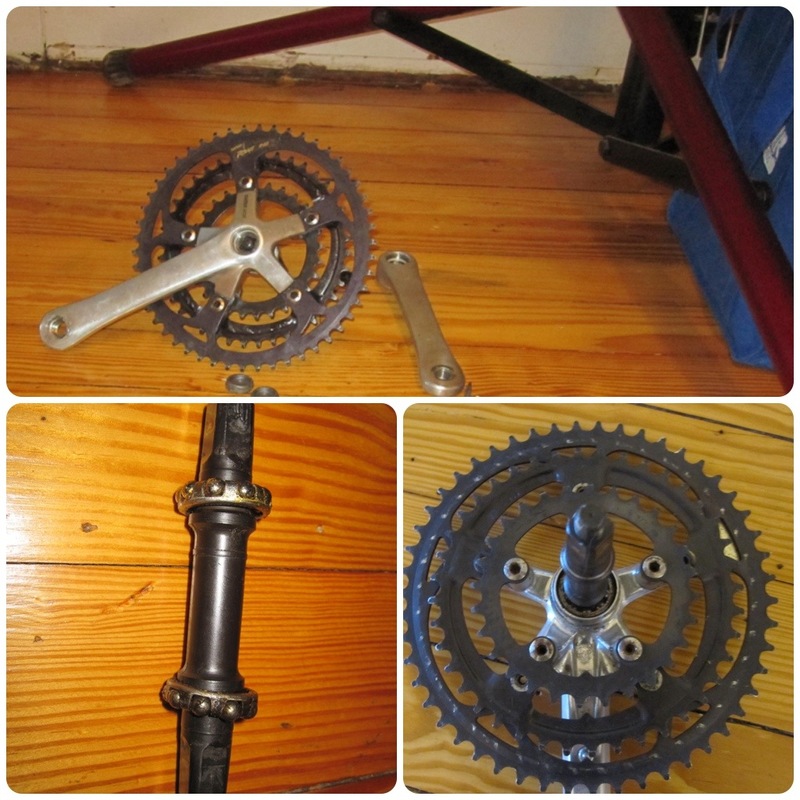 FYI the crankset is composed ot chainrings, the spindle in the bottom bracket which ultimetely attaches to the crankarm, the retaining ring, chainring bolts, the “spider,” and the chainring bolt and chainring fixing bolt. The Front Derailleur is composed of a cable anchor, clamp band with clamp bolt, pivots, an outer arm, an inner arm, an outer cage plate, and an inner cage plate. You want the face plate (a.k.a. the outer cage plate) of the front derailleur to be parallel with the chainring before you secure the derailleur to the “seat tube” of the bike. When fastening the front derailleur to the bike, it is also vital that there is no clearance between the upper teeth of the chainring and the plate of the derailleur. 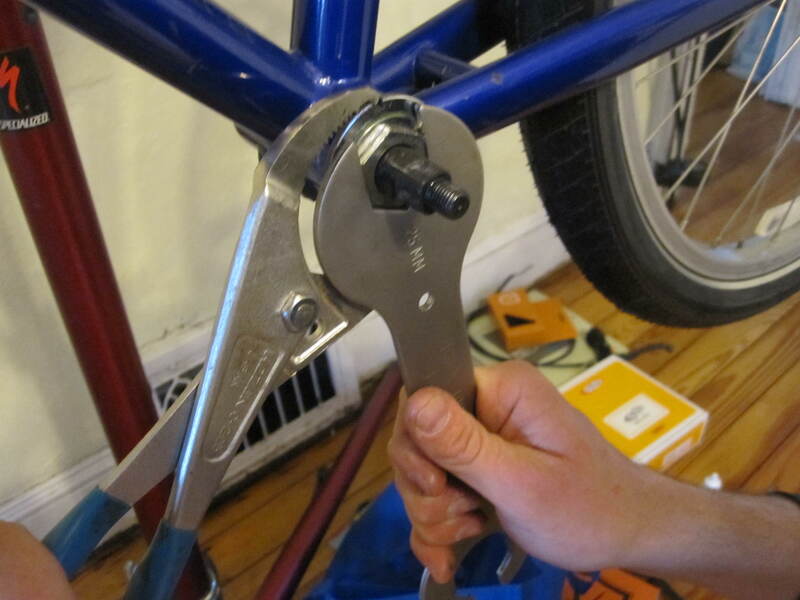 You use your allen key to secure the derailleur in place using the clamp bolt, a part of the derailleur. 8. 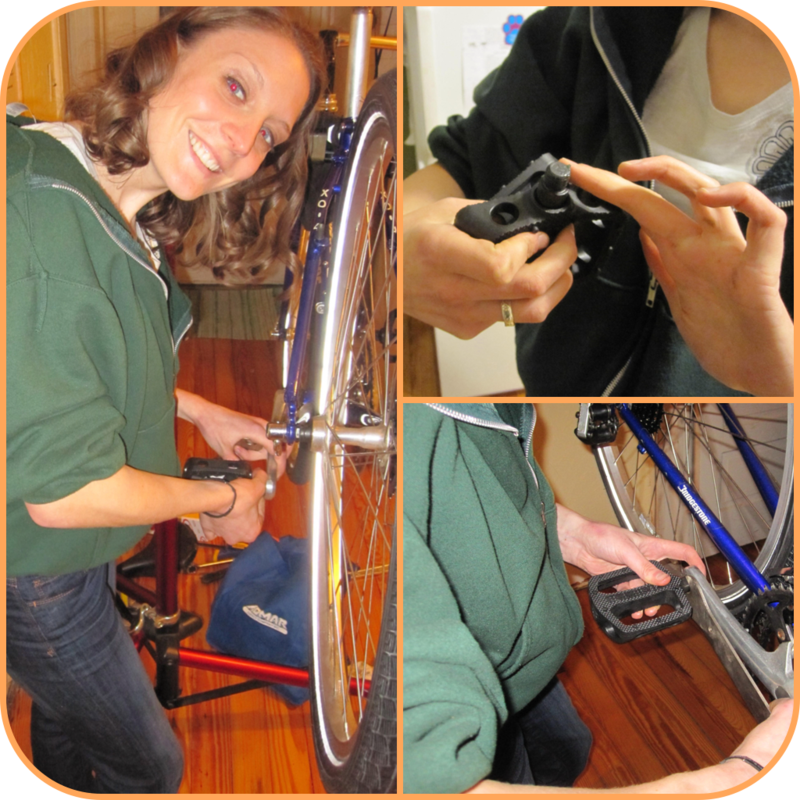 Pedals are one of the next step *Note, there is more than one way to put together a bike. This is simply the way we did it. I have platform pedals. 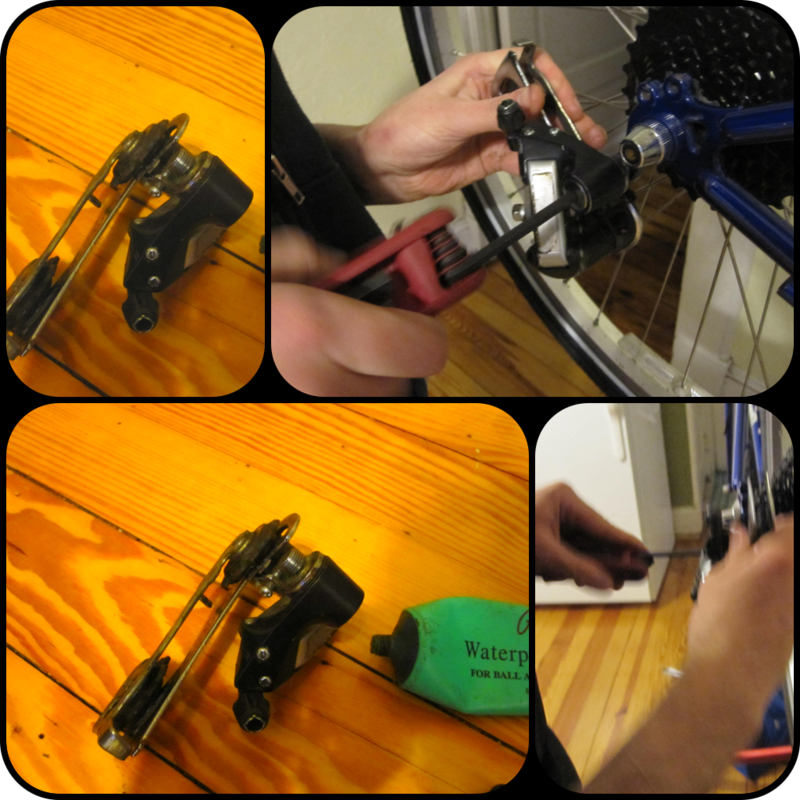 The key to pedals is to know the left pedal is reverse threaded, which means you must turn it counterclockwise (after you grease the threads, of course) when inserting it in the crankarm. The right pedal twists in clockwise. And, it is vise versa when you remove them. And, that’s it (for now). Learning to build a is a tedious but fun activity to learn how to do! 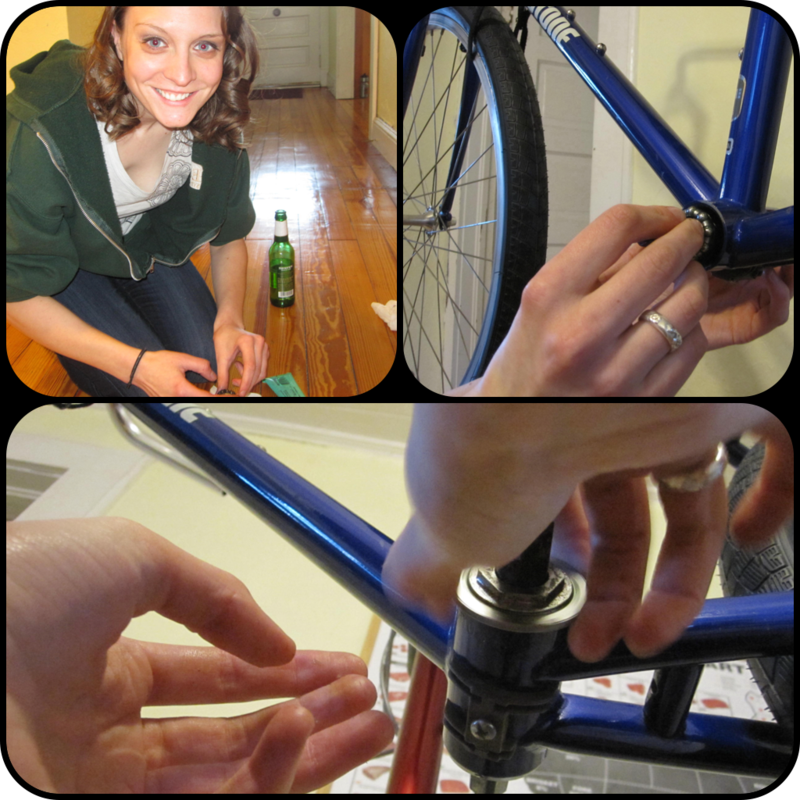 The next installment in this series on bike assembly will be coming shortly. 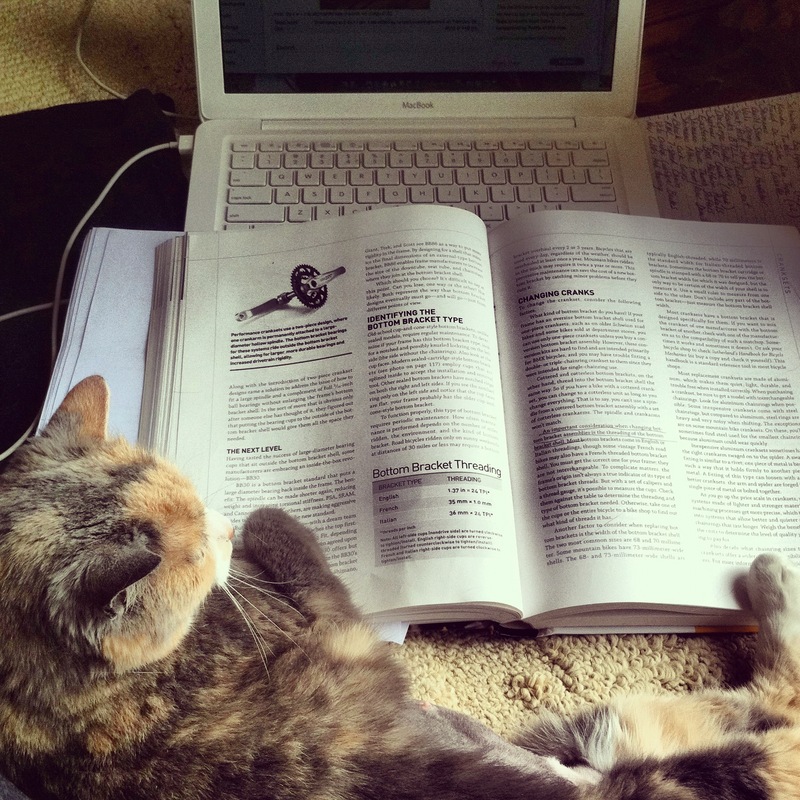 Fur Ball helping with the writing and research of this post.